Arles is truly experiencing a renaissance. The first, visual clue is the rising height of Frank Gehry’s latest metal-clad museum masterpiece that is in the works at the site of LUMA Arles. 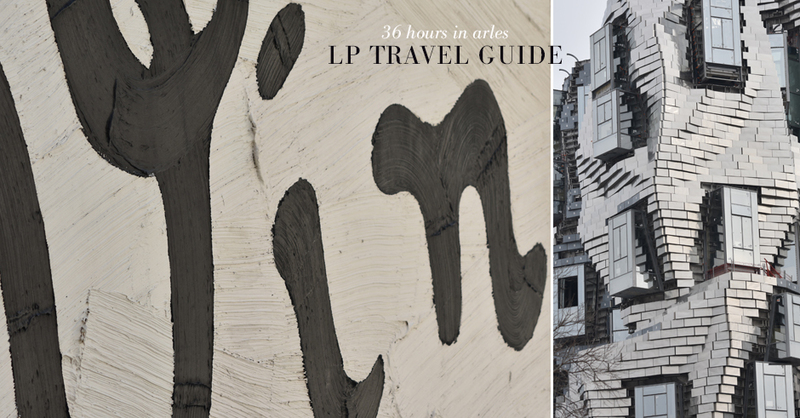 Luma Arles is a grand project driven by art patron and cultural maven, Maja Hoffman, the mastermind re-shaping the city’s landscape, culture and art scene of this ancient roman city of Provence. 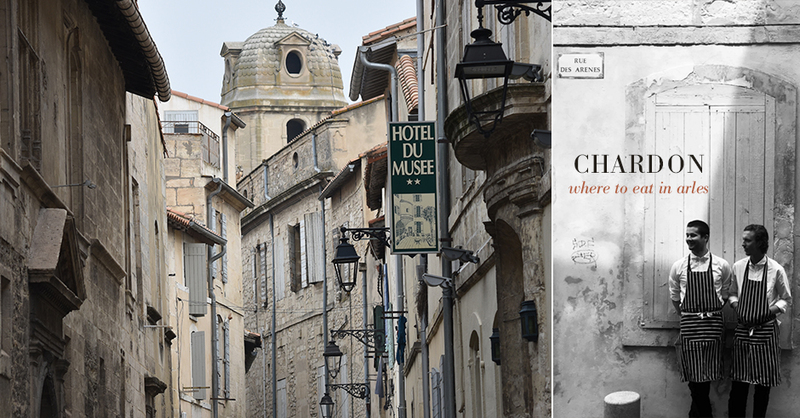 I felt the exciting energy everywhere, from the construction sites throughout the city, to the local artisan ateliers and chic boutiques where everyone I met with is talking about the renaissance of Arles… finally arriving. 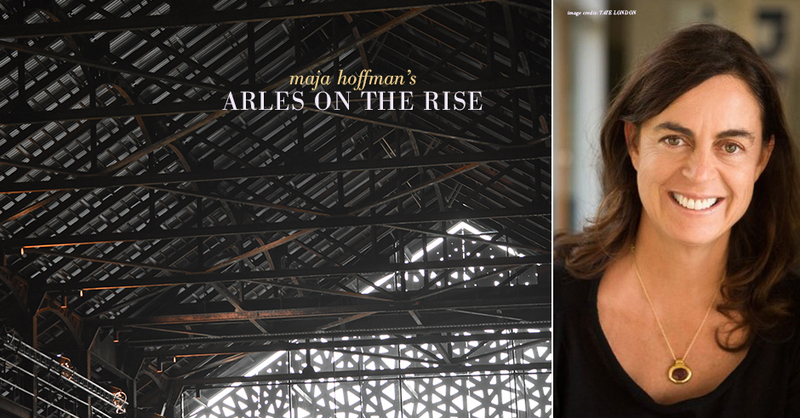 Maja Hoffman (pictured above left) is an avid Swiss art collector, art patron, filmmaker and visionary entrepreneur passionate about Arles, who brings with her a rich family heritage for preserving and collecting the world’s finest artists. Her grandmother, for example, Maja Stehlin (1896–1989), collected Pablo Picasso, Jean Arp, Fernand Léger, Jean Tinguely and Georges Braque. The city of Vincent Van Gogh is officially blossoming into the art capital of Provence grâce à elle. As part of this major initiative to transform Arles into an art city, Hoffmann founded LUMA Arles in 2014, breaking ground on the cultural complex designed by Frank Gehry for the production of: art exhibitions, research, education and archives, scheduled for completion later this year. Architect Annabelle Selldorf is currently renovating five 19th century industrial train stations, two of which are currently open for visitors, into working atelier spaces. 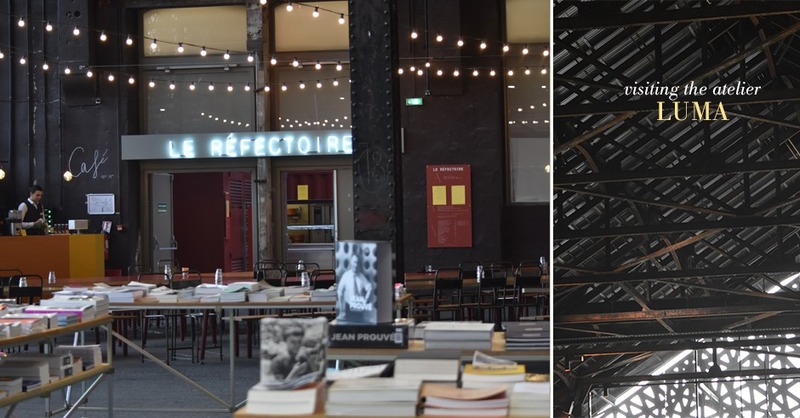 The Luma Ateliers are focused on making and showing art, which includes the Le Réflectoire des Ateliers, a lovely cantine and bookstore space at the entry within the foundation. The Atelier Luma is a think tank, a production workshop and a learning network of the Luma Foundation. Atelier Luma wants to co-develop new ways of producing and caring for a city and a bioregion, using design as a tool for transition. Since its foundation in 2016, Atelier Luma conducts projects connected to six strategic themes: Waste Matters, Producing (in) the City, Healthy Mobility, Next Hospitality, Food Circle, Circular Education. The exhibition I visited upon opening, breaks from its buildings’ past to a sustainable future, by selectively showcasing its designers-in-residence creations featuring innovative use of natural materials within the presented themes. 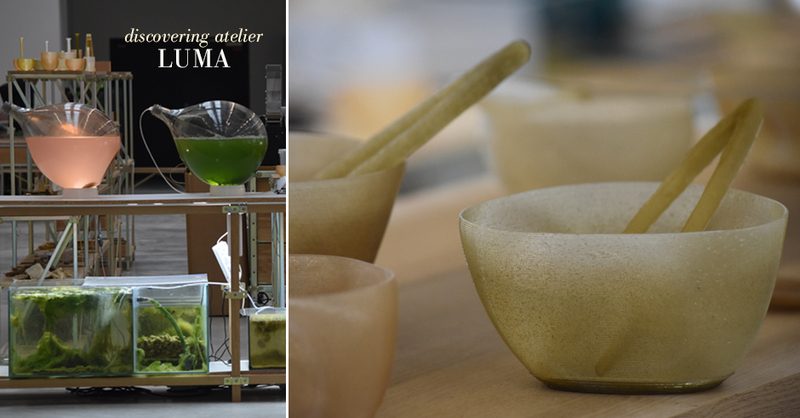 From converting algae into a viable 3-D printed form for beautiful household objects, to transforming seashells to sturdy beautiful countertops; I found the atelier experience to be a welcome modern “makerlab” space with something for the whole family to enjoy. These converted industrial spaces were also designed to house photography as part of the city’s annual international photography festival, Rencontres d’Arles (which takes over the city each summer). In addition, Hoffman recently purchased Martin Parr’s 12,000-strong photobook collection, in partnership with Tate London, plus the archives of celebrated photographer, Annie Leibovitz (one of my all-time favorite American photographers) which will be available to view in Arles. 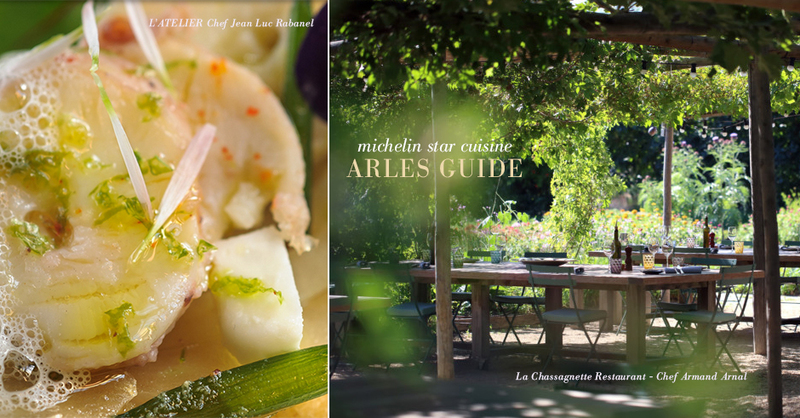 Ms. Hoffmann is also behind many cultural projects in the area, including the Michelin-starred organic restaurant, La Chassagnette (more info below). This organic, farm-to-table restaurant concept is in the Camargue, just outside of Arles, and has quickly become a must-visit gastronomic destination. She is also behind the recently completed renovations and expansion of L’Arlatan, a former hôtel particulier located in the center’s oldest neighborhood, which is an exciting new luxury hotel and restaurant experience. 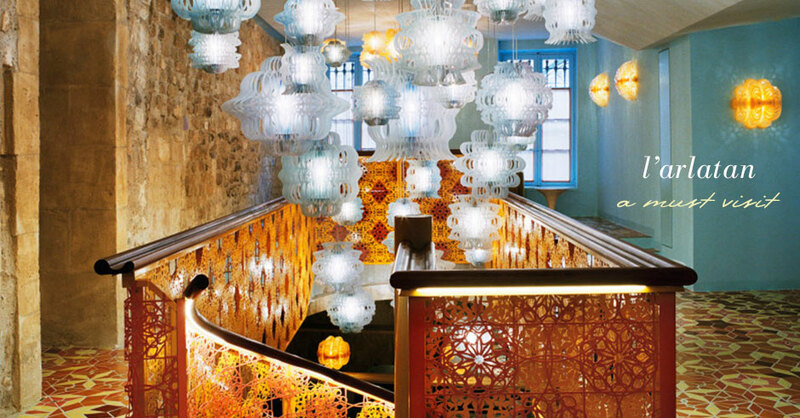 A stay at the hotel, cocktail or meal at the restaurant is a visual feast for those design-lovers. I had a fantastic lunch with an extremely attentive staff, who was very accommodating to my complicated gluten-free, dairy-free diet which was quite a treat. 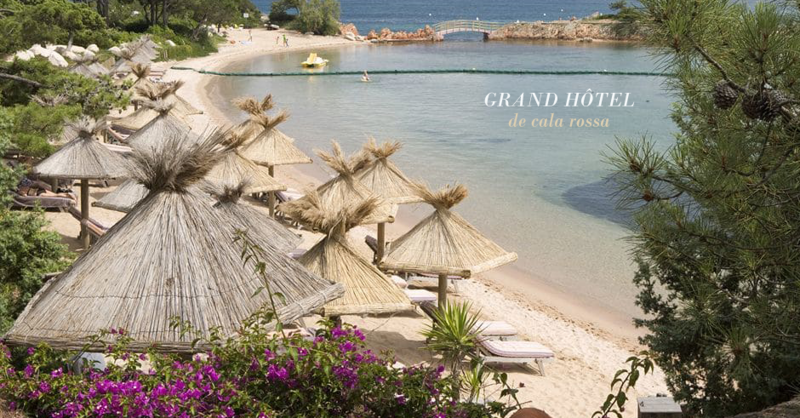 The restaurant proposes a seasonal menu of simple dishes, and offers you a chance to discover a selection of Provencal and Mediterranean flavours. 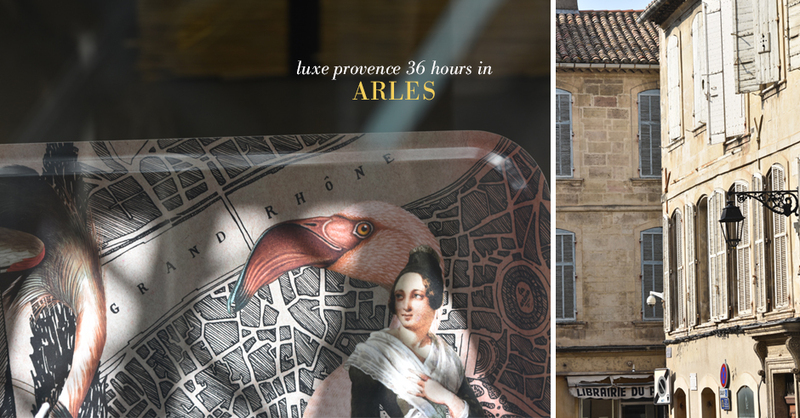 So, if Arles didn’t already impress you with its Vincent Van Gogh history, impressive list of museums, Roman Amphitheatre and Saint-Trophime, Camargue personality or classic 18th century architecture… perhaps it’s time to give it a second look. 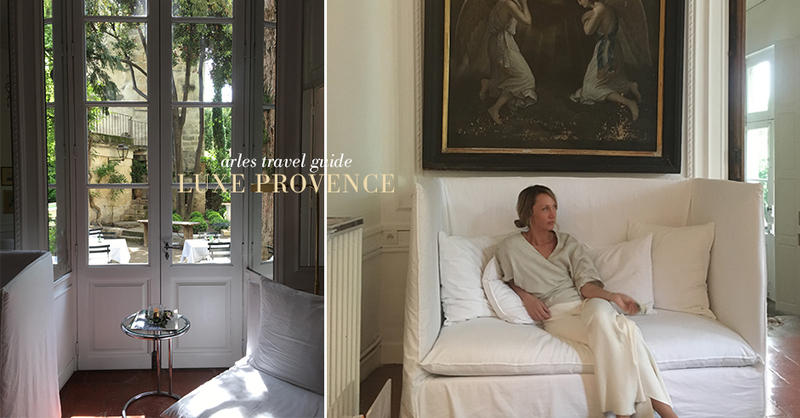 To help you discover the new Art Capital of Provence, we have prepared a guide over the last few months featuring our own insider’s travel tips to the city of Arles. Friday: Visit the new Atelier Arles at Luma and check out the Frank Gehry designed museum underway, followed by a fabulous dinner and wine pairings at the hip restaurant, Chardon. Be sure to reserve in advance and communicate any food allergies, or restrictions via their website. Chardon is a hip spot featuring an exciting concept of pop-in, chefs-in-residence from around the globe who create innovative menus featuring Arles’ organic, local ingredients. Our travel team dined here in April and were very pleased with each dish that brought together unique and innovative flavor combinations. Choose from either the a la carte options (from 2 to 20 euros), or the discovery ‘Feed Me’ Menu (at 39 euros) designed to be shared. Saturday: Start your day at Arles’ Saturday market. 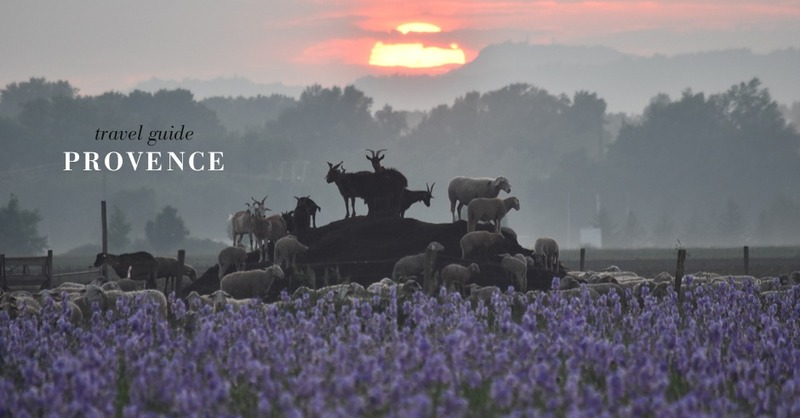 It is one of Provence’s finest and known for its organically grown Camargue rice and vegetables, local cheeses, taureau saucisson, olives and anchoaïade. Pick up some colorful ‘les indiennes’, the traditional Provence fabric for your table, and walk the pretty shaded stall-lined city streets for a variety of color and endless photo options. 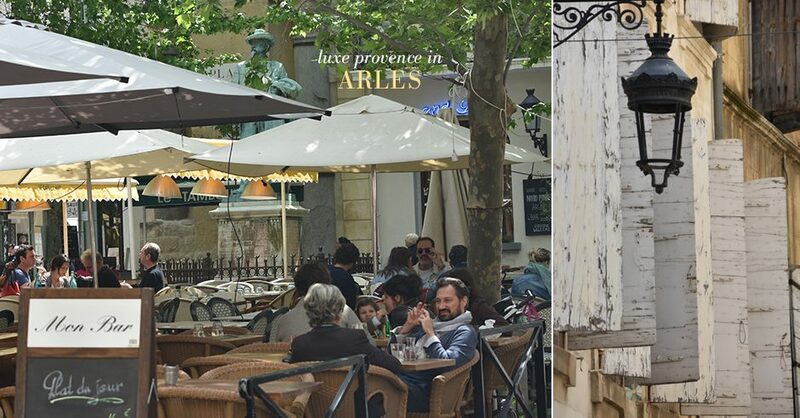 Lunch at the charming Le Galoubet (16 to 35 euros plates; 18 Rue du Dr Fanton) with its gorgeous, vine-covered terrace for fresh, Mediterranean dishes to experience the local produce sourced from the market. It’s located just down the street from the Foundation Van Gogh, if you fancy to add in a visit. 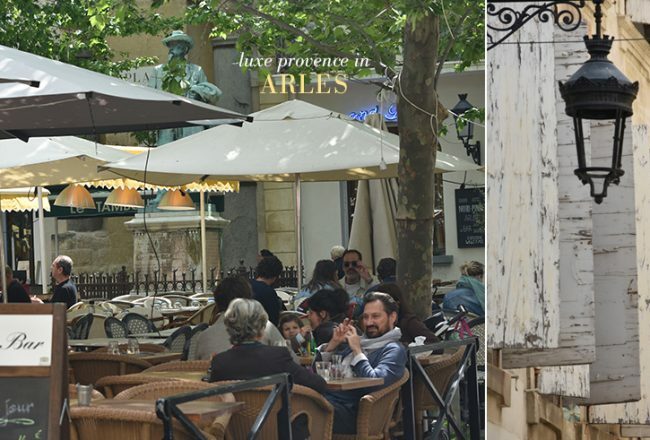 After lunch, try a bit of local artisanal shopping, or simple cafe life in Arles’ historic, old town (see our recommendations below), then reserve your dinner with Jean Luc Rabanel, the 2-star Michelin chef who runs two restaurant experiences here. Choose between the more formal restaurant, L’Atelier (55 to 145 euro menus of 7, 9 or 12 courses) for a surprise sensorial experience you won’t forget, or sample his Le Bistro À Coté located nearby for your first foray (32 euro retour de la marché menu). Or for a more chic, night out, pop in for a cocktail or dine at the new Arlatan Restaurant for fresh Mediterranean and Provencal cuisine in a visually stunning setting. 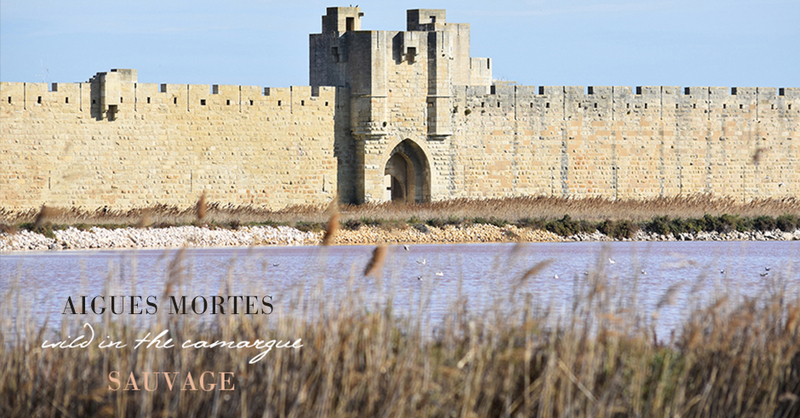 Sunday: Visit to the Camargue’s charming citadel Aigues Mortes (pictured above, Camargue guide coming next!) in the morning for a glipse at the pink hued salines and charming village. Then stop off at Saintes-Maries-de-la-Mer for a long, Michelin-star organic lunch at the charming, Chassagnette. Alternatively, if you prefer staying in town, be sure to try Le Gibolin (13 rue des porcelets) a lovely locals’ favorite for delicious, fresh and simple, organic dishes and an excellent cave à vin (28 to 50 euros). Find traditional local dishes from pieds et paquets à la Provençale, and calf’s liver with persillade paired with market fresh vegetables. Hôtel Particulier: This stunning néo-classique manor and les ecuries (a stunning converted stable) is one of the last remaining architecture gems of Baron de Chartrouse. 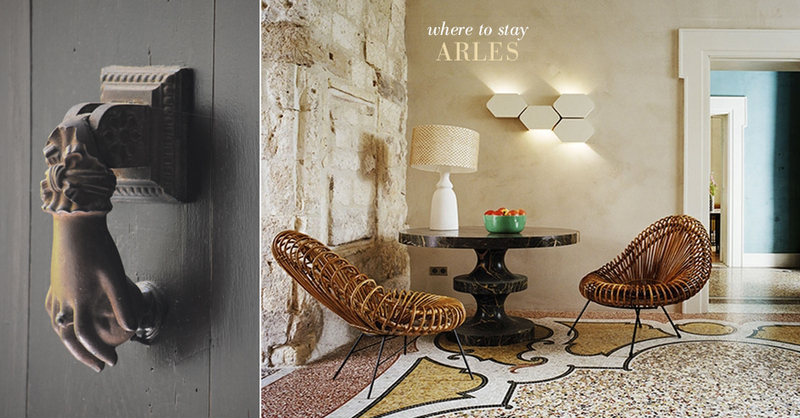 The Hôtel Particulier Arles has been converted into a 5-star luxury hotel perfectly located in the center of Arles on a quiet street. The architecture of the property and suites are very beautifully designed, tastefully mixing its classic eighteenth century bones and high ceilings with a soft, modern touch. Unfortunately, we had a difficult time actually confirming our reservation with the staff and were a bit disappointed by the spa services and general amenities that are normally associated with a 5-star property, but the private retreat aspect and décor are divine. The garden, terrace and heated pool are delightful offering a picturesque place to cool off and relax. Or, simply enjoy the charming setting for a private breakfast or lunch during your stay. 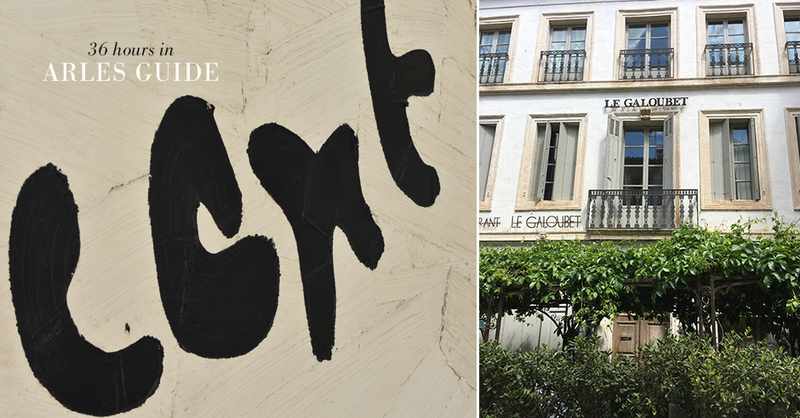 Hôtel du Cloître: This is a charming, small boutique hotel with modern touches just near the arena and antique theater featuring its own market-fresh restaurant, L’Ouvre Boite, set in a lovely side street courtyard in the warm summer months. A great value option and dining during warm summer nights under the twinkling lights of the bistro is perfectly charming. 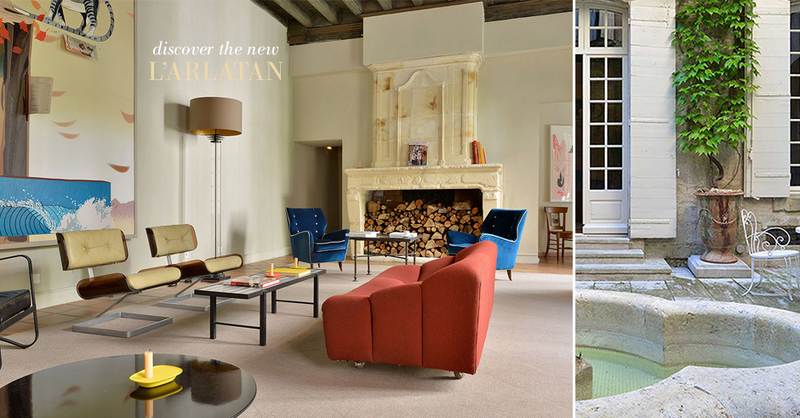 L’hôtel d’Arlatan: A must-stay selection for the design-lover, this exciting new hotel has been meticulously renovated from a former, Hotel Particulier and is located in the centre ville. 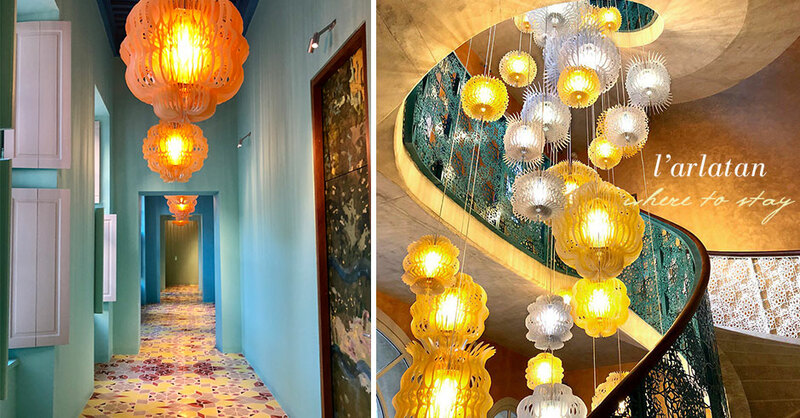 The overall design is stunning, a visual feast for the senses, combining classical elements, cultural bold, colourful arlésienne style delivered in a completely, modern chic way. This hotel has been created within several adjoining buildings and the restaurant is a lovely place for a cocktail, or modern Mediterranean-style meal. While you’re in the city, here are a few of our personal favorite boutiques, artisans, ateliers and local concept shops to visit. 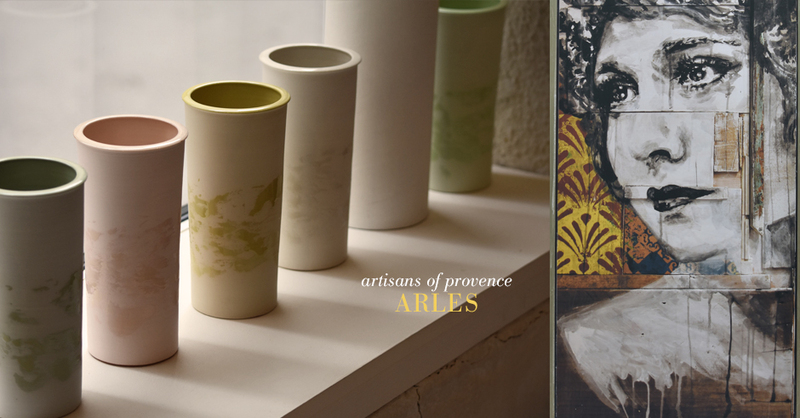 Stop into Atelier Sophie Lassagne (12 Rue de la Liberté) to purchase one of her beautiful matte ceramic vases (picture above left), or sign-up for one of her hands-on classes or workshops to experience the artists life in Arles, if even for a few hours. 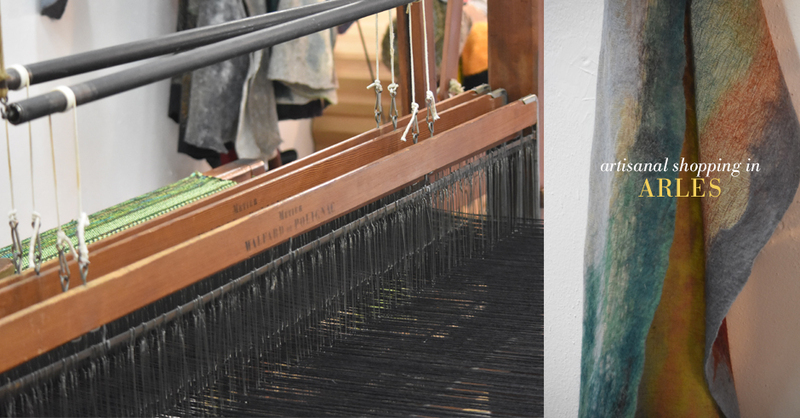 Visit the workshop and atelier of Marie Hélène Desort, Le Métier d’Art (6,rue Docteur Fanton), to discover her handwoven wool creations. Marie-Hélène weaves her pieces on a large antique loom and creates her own original, colorful range of clothing and accessories made from natural materials. All creations are unique pieces. Also, I discovered some beautiful wool scarves from another textile artist, Cécile Tabet, also present in the boutique, who fashions felt for her creations from the Cévennes into beautiful, dyed organic colors and forms. 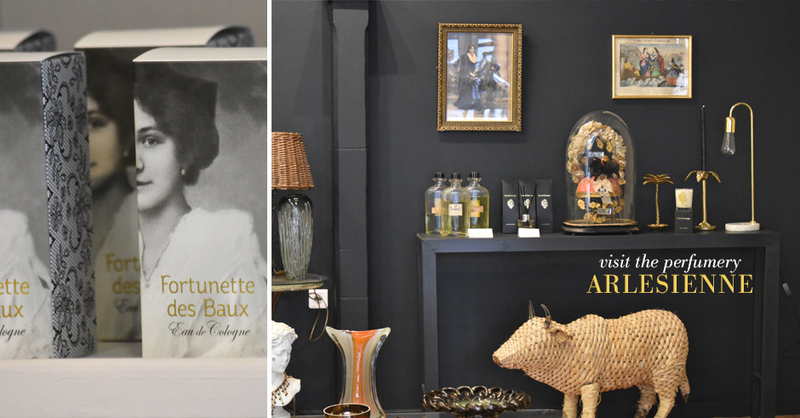 Be sure to visit Fabienne Brando at the Arlesienne Perfumer (26 rue de la liberté), who has exquisite taste and creates her own niche line of perfumes. 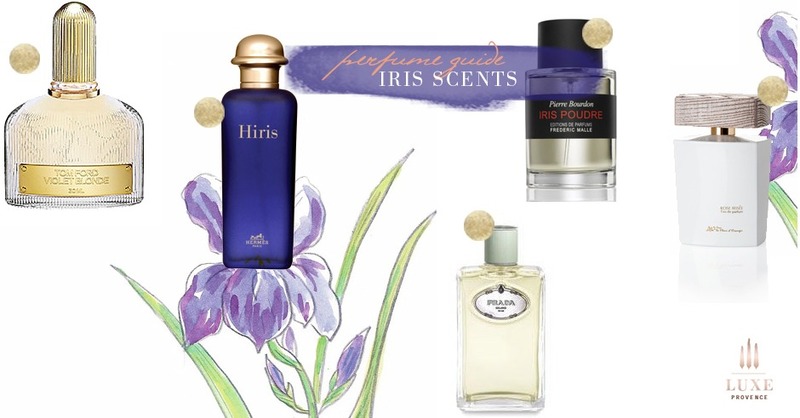 The fragrances are unique and fantastically Arles, presented in gorgeous artistic packaging. Bring home her latest home fragrance release, A Cloud of Flamingos as a wonderful olfactive souvenir of your trip. Stop in to Dou Bochi (16 rue Réattu) for a mix of global and locally created artisanal objects chosen by founders, Eric Bergère et Antoine Rambourg. The boutique carries Eric’s private label clothing line produced in high quality natural, fabrics and has worked for such luxury fashion houses as, Lanvin and Inès de la Fressange. Moustique Arles (2 rue Jouvène) is a lovely concept store where we found this fun, Arles tray (pictured above left) and offers an excellent selection of housewares, artisanal pieces, jewelry and gift items. We hope you enjoyed our well-researched selections and you may just need more than 36-hours to visit. Let us know what your favorite places are below! 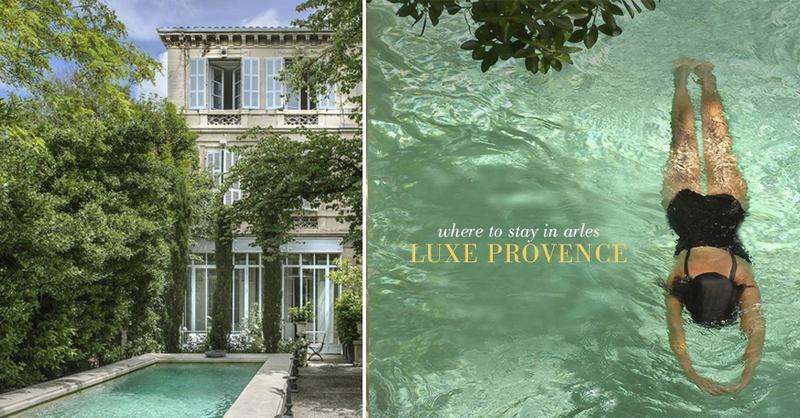 On-location photography and article by: Tarik Koivisto, Founder & Creative Director, Luxe Provence. Special thanks to my travel team: Vanessa and Laura. Why hello!? 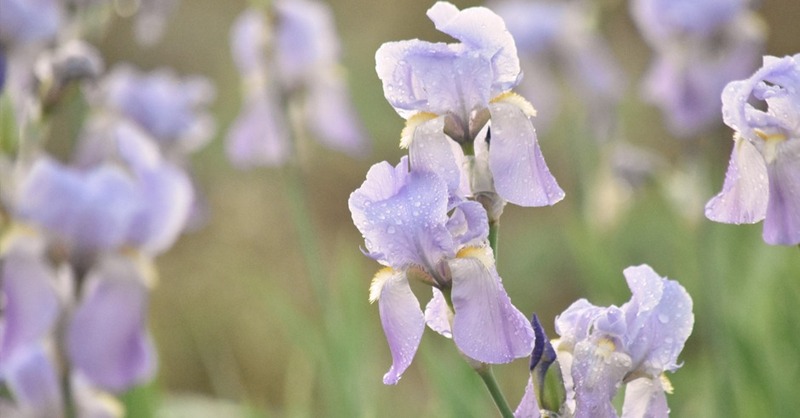 Spring is just around the corner here in Provence, and well, haven’t we been off hibernating for quite some time? As a few of you may have caught via my social media posts, I have been battling some pretty serious health issues, which have hit me hard over the past few months and slowed me considerably… so I thank you for your patience. 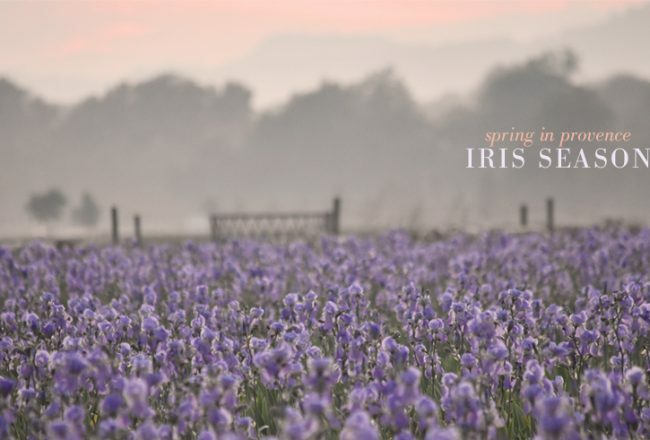 The good news is, I am breaking through the hardest moments and coming back from hibernation along with the blooms of spring, ready to celebrate my favorite season. I am very excited to present our new collection, An Artist’s Life, featuring limited edition pieces for both the creator… and muse in you. 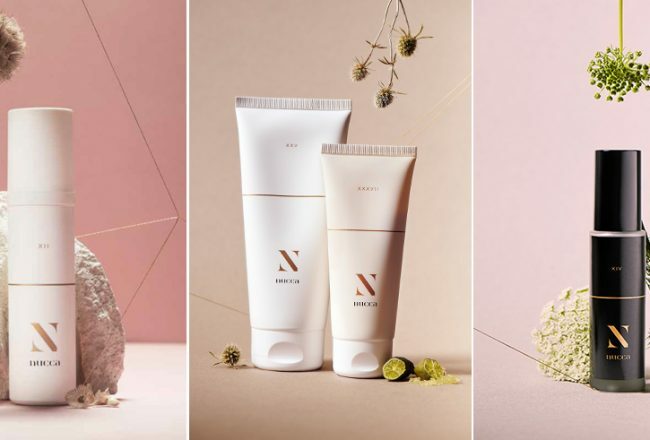 Shop the limited edition collection here, while it lasts, with new Provence inspired style added each month. Be sure to follow us on Instagram, or subscribe to our mailing list for upcoming limited edition releases. 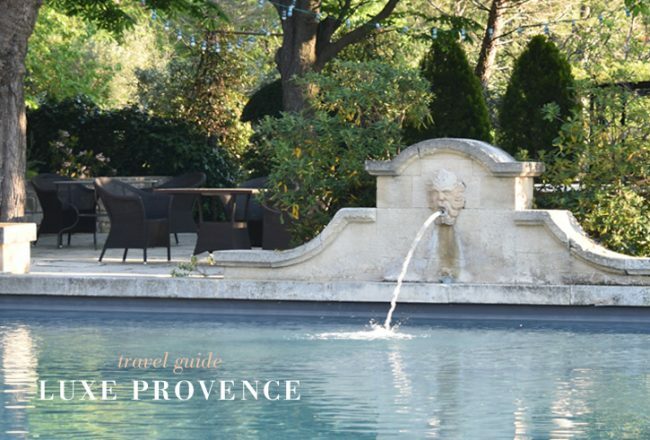 We will be posting lots of new fresh content, including: Provence travel and wine guides featuring our favorite secret places and insider’s guide to the finest rosés and vineyards, so stay tuned! For those in the know (a.k.a. 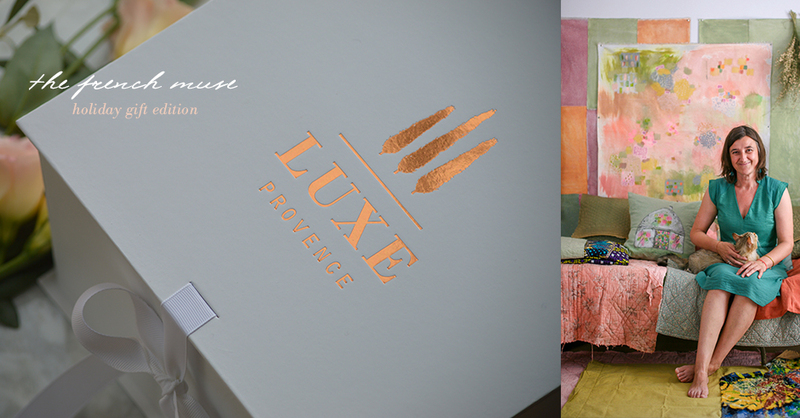 our subscribers), you have already discovered our newly launched Luxe Provence Artisanal Candle collection. 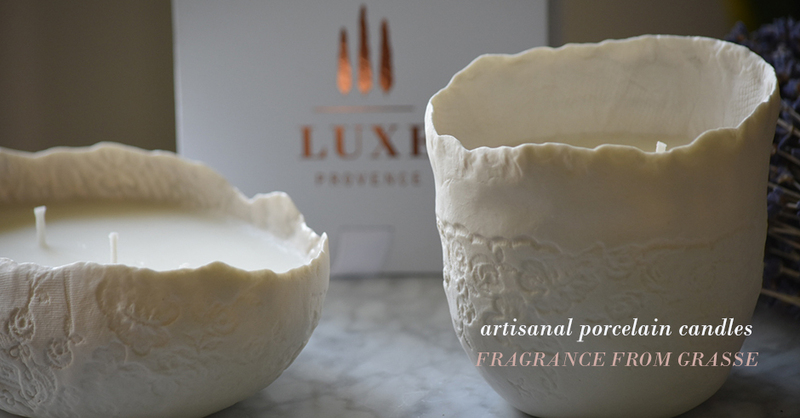 We are working with the finest Artisans of Provence each season, from perfumer to ceramicist, to design heirloom quality porcelain candles featuring the finest fragrances available from Grasse, the perfume capital of the world. 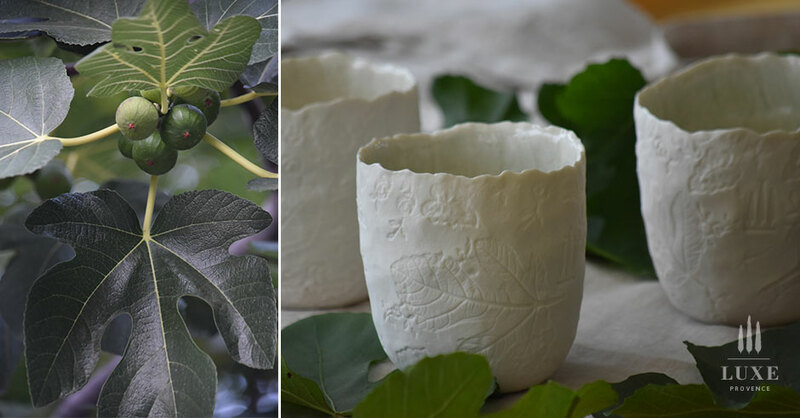 Our Artisanal Candle Subscribers are the first to discover our fragrances and new candle designs each season featuring handmade porcelain vessels created exclusively by one of our favorite ceramicists, Valérie Casado of Isle sur la Sorgue. 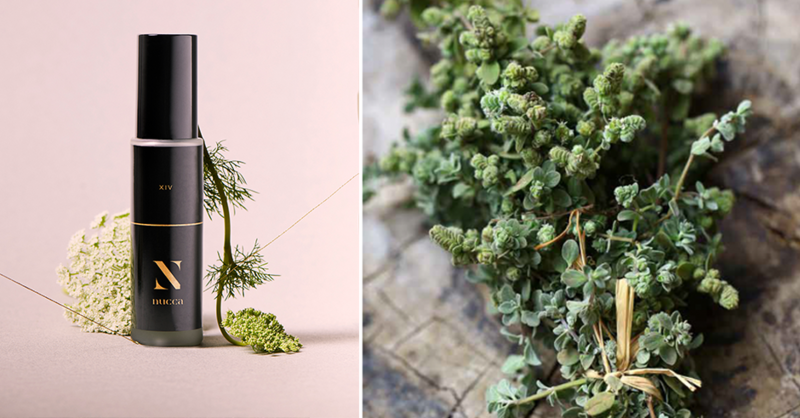 For our first fragrance collaboration, we teamed up with Grasse perfumer, Stéphanie Bakouche of Sensaba. Stéphanie, an active member of Versaille’s Osmothèque and Accords & Parfums, is the talented young nose behind luxury niche fragrances: Rose Privée by L’Artisan Parfumeur; Jul et Mad’s Fugit Amor and Mon Seul Desir; and Cloon Keen Atelier’s Bataille de Fleurs. 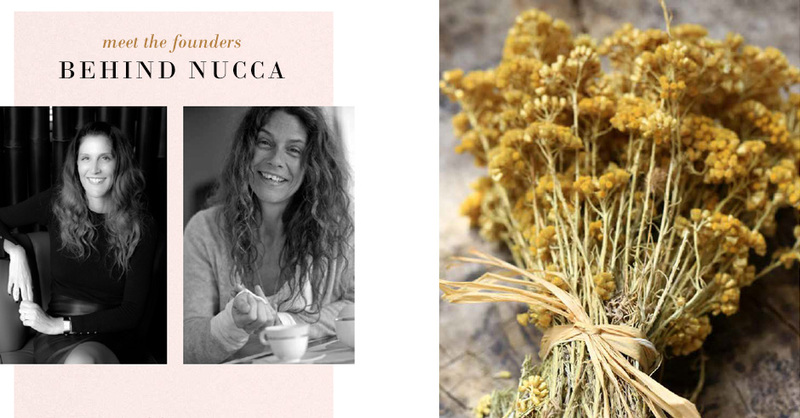 Stéphanie spent seven years in fragrance development for brand, l’Artisan Parfumer, and as a student and colleague of nose, Bertrand Duchaufour. 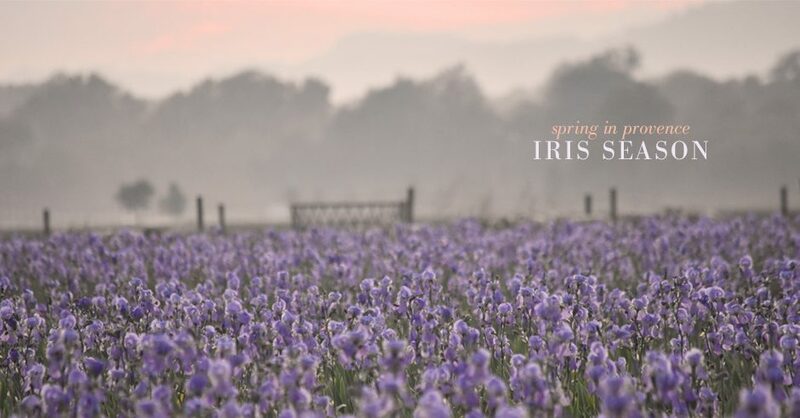 She is an independent member of Accords & Parfums, the acclaimed perfume center located on the historic Domaine Sainte Blanche, with direct access to the highest quality fragrance ingredients and latest technology innovations in the world of perfumery. The prestigious center was founded by Olivier Maure, well-known for passionately protecting Grasse’s perfume heritage for decades, alongside Edmond Roudnitska at Art & Parfum, the first independent nose and French Master Perfumer. Roudnitska is behind many of today’s bestselling fragrances of all-time which were created on the property, such as, as Dior’s Eau Sauvage, Diorissimo, and Rochas’s Femme. 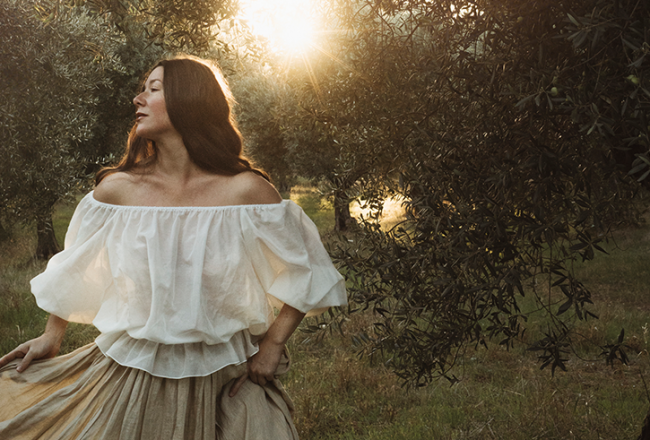 We are thrilled to collaborate on our first Luxe Provence fragrances with such a rising talent who perfectly embodies our brand values working as a passionate artisan while also protecting and advancing the high quality perfume heritage here in Grasse. 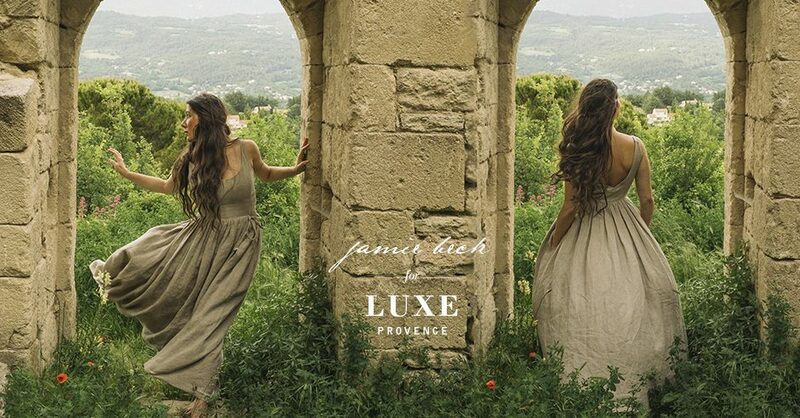 Our premiere Luxe Provence fragrance release is Mediterranean Fig, inspired by Luxe Provence founder’s fond memories of her family’s first summer spent in Provence’s magical calanques. 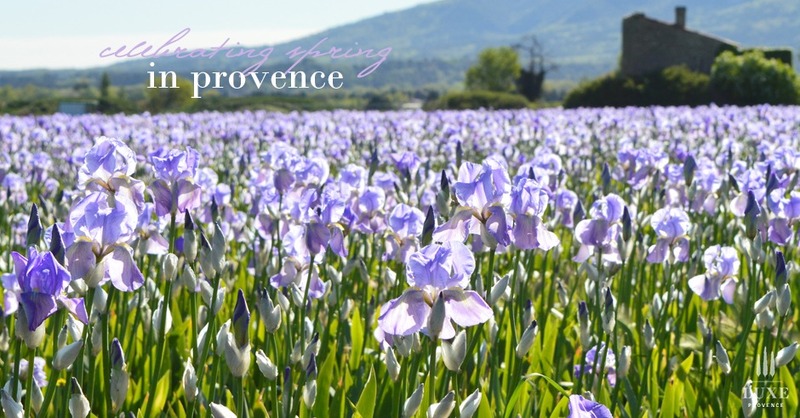 We will be releasing new Provence inspired fragrances this year for individual purchase on the site later this year. 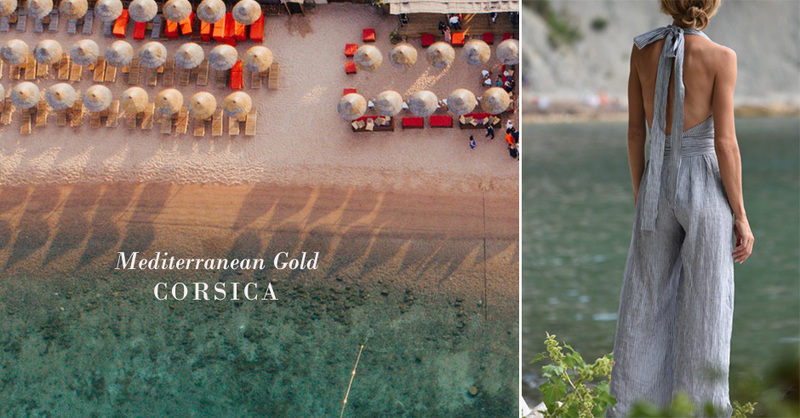 Be sure to discover our first release, Mediterranean Fig available as a single luxury candle, or subscribe to be the first to discover each new fragrance with 6 seasonal deliveries from Provence to your doorstep throughout the year. 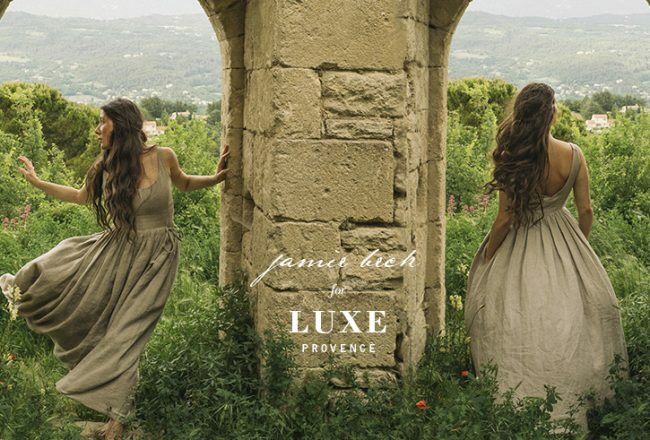 The Jamie Chemise has Arrived… Pre-Sales are ON NOW for our second design collaboration piece with Jamie Beck for Luxe Provence. 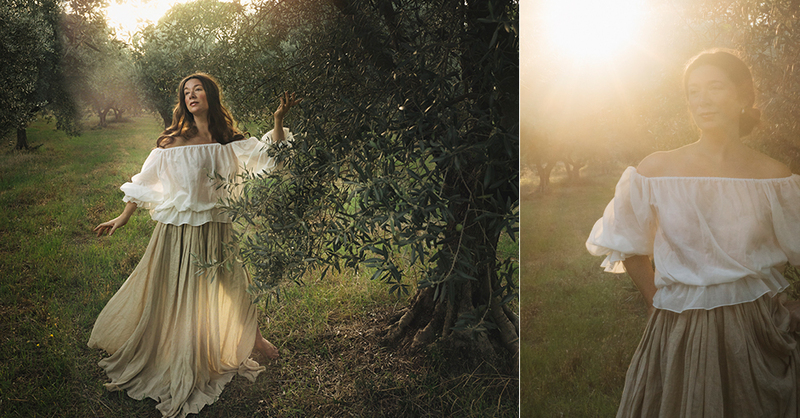 Designed to float effortlessly through the olive orchards of Provence… to the streets of Paris or New York. The Jamie Chemise is made of voluminous, Italian silk/cotton voile, available in feather. UPDATE: Our first release has just shipped, so be sure to place your Pre-order now for our next delivery shipping on December 5th…in time for the holidays. It’s the perfect gift idea, but only while limited supplies last! 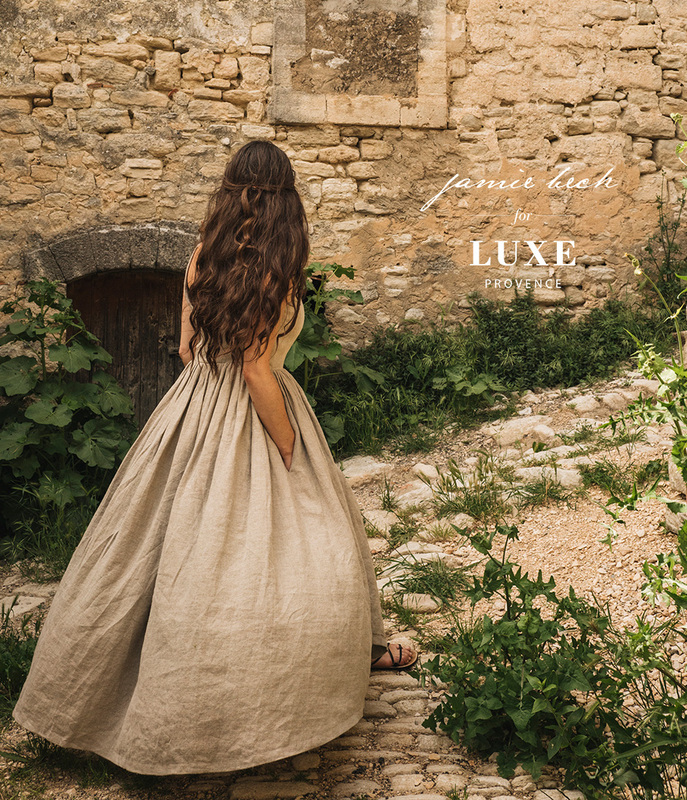 UPDATE: The linen skirt is a sneak peek and will be featured as part of Jamie Beck for Luxe Provence SS19 collection coming this spring. 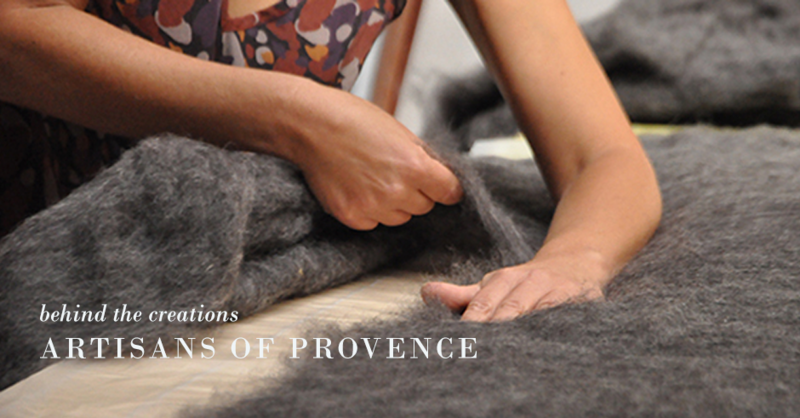 Collect each piece to have a complete capsule wardrobe, proudly designed and ethically Made in Provence. This season, we’re excited to collaborate with a guest curator for a special, limited edition French Curiosities Holiday Gift Curation, the perfect gift for the French antique and art-lover on your list. 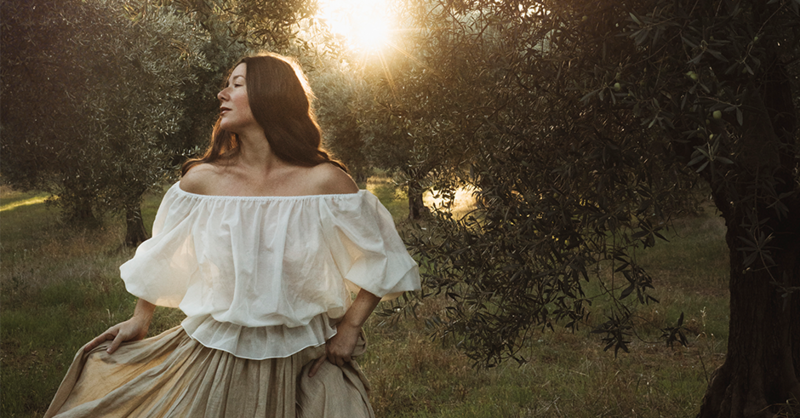 We’ve asked Ruth Ribeaucourt, founder of The French Muse who offers amazing travel and events here in Provence, to guest curate this magical, bespoke collection featuring her favorite antique treasures, combined with unique limited edition pieces from local Provence Artisans. 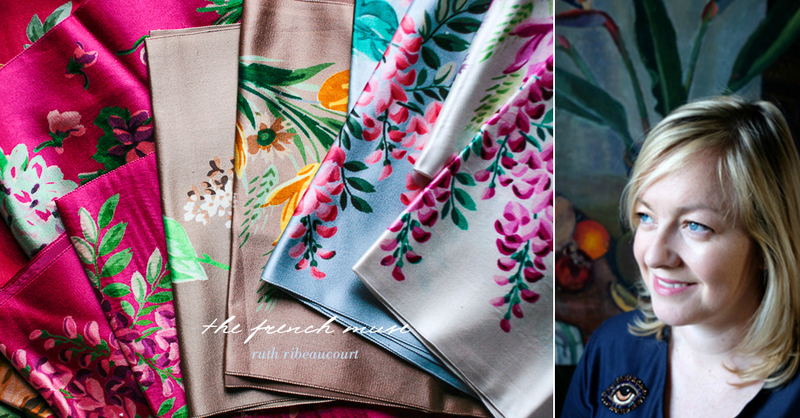 Ruth Ribeaucourt is Irish born, but definitely French at heart and is passionate about antiques, vintage textiles and artisanal creations. As a jewellery designer, antique textile dealer, European contributor to Where Women Create and travel guide (whew! ), Ruth finds beauty at the French flea markets and shares her treasures with admirers across the globe. 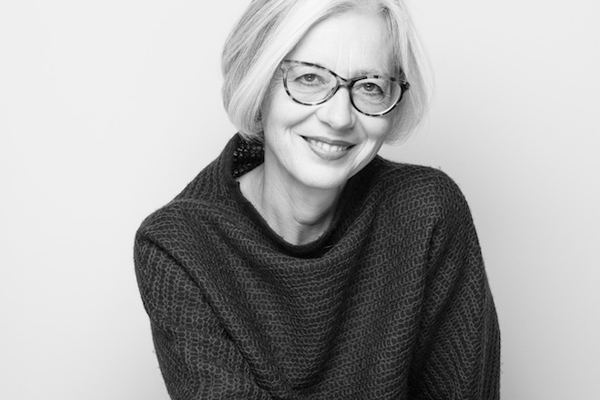 Ruth also serves as communications director for her family company, Julien Faure, a celebrated haute couture ribbon maker in St. Etienne, which creates ribbons today for Chanel, Hermes, Dior, Valentino, Gucci, Rochas and Dolce & Gabbana. We met with Ruth this past summer in Aix-en-Provence to discover her family’s ribbons and in search for French antique lace and vintage detailing inspiration for our lifestyle line creations. 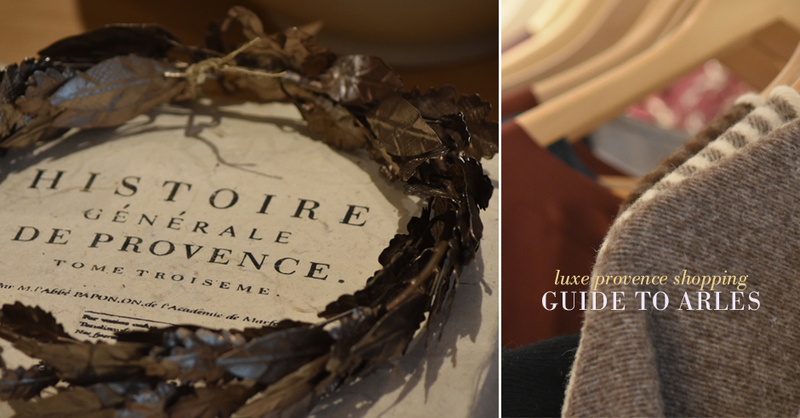 We are thrilled to have her share some of her luxury silk collectibles, antique expertise and favorite artisans in this special edition curation arriving this holiday season, designed just for you. Aurélie Alvarez is a visual artist from the celebrated French town of Isle sur la Sorgue in Provence. 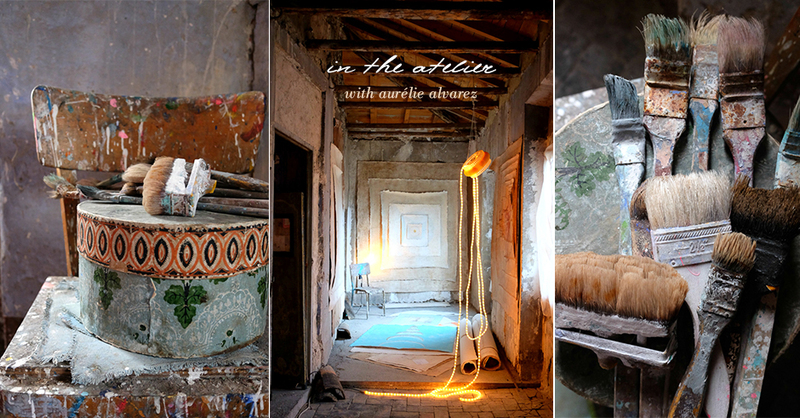 I discovered the work of Aurélie a few years ago, in the concept store, La Caravane des Créateurs, in Saint Rémy de Provence. Her beautiful artwork was presented alongside one of my favorite local textile artisans, Aurore Pelisson, and turns out, of course they are also friends. 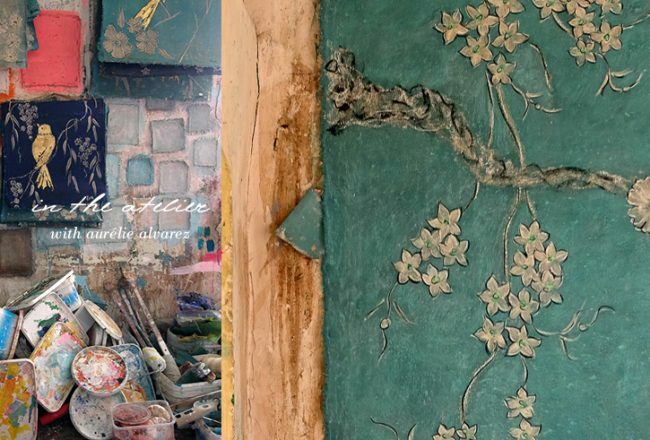 From her atelier in the rafters of a 16th Century hotel particulier, Aurélie, a graduate of fine arts, paints decorative and contemporary works. 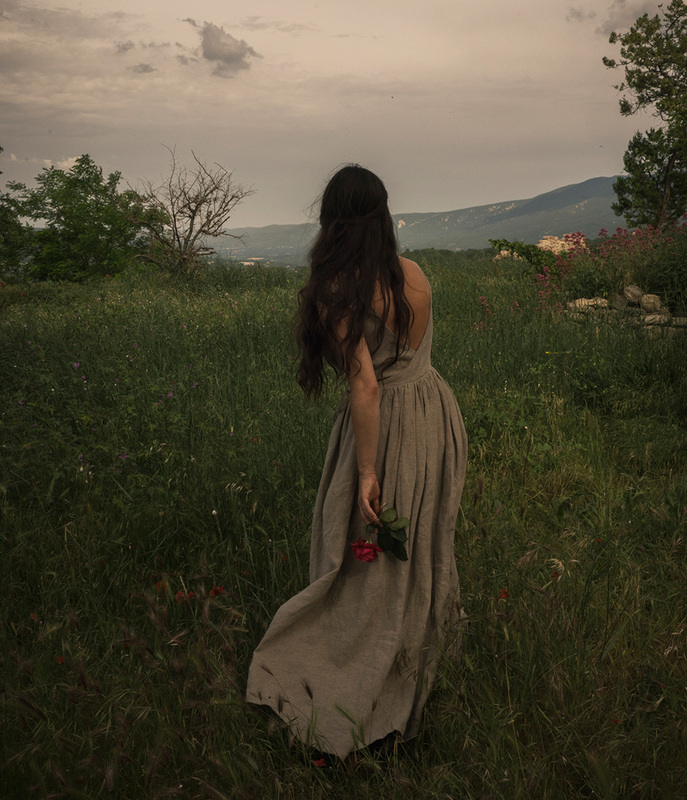 We’ve had our eye on Aurelie’s work for some time now and are pleased to learn that she is also one of Ruth’s selections for this special curation. We are thrilled to share that she is creating a special limited edition painting featuring original gold foil bird for this curation (valued at over $150 USD alone). Her decorative work focuses on lightness, simplicity and the poetic, and includes a colourful universe of plants and animals. All of her work explores the duality between science and spirituality, her personal journey to the heart of matter and colour. We cannot wait to share this special curation with you. Please be sure to reserve yours today, these are available only in limited quantities… while supplies last and feature original work and unique, antique silk and vintage finds by Ruth. 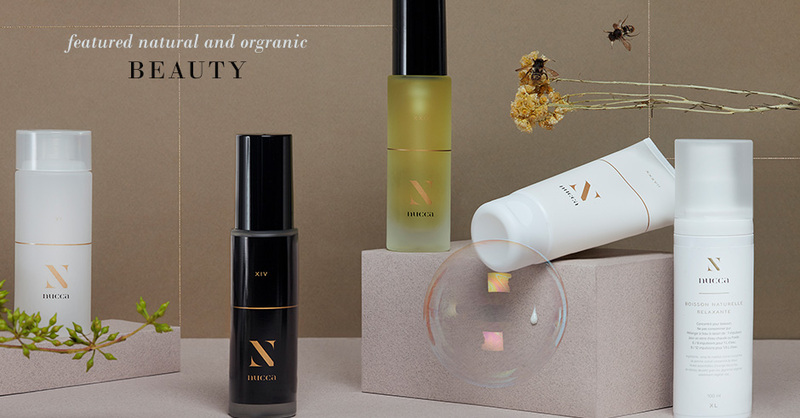 Each curation will contain a handwritten gift note, by request (please include your note upon check-out), and will be shipped from Provence by DHL International Priority prior to December 15th, 2018. 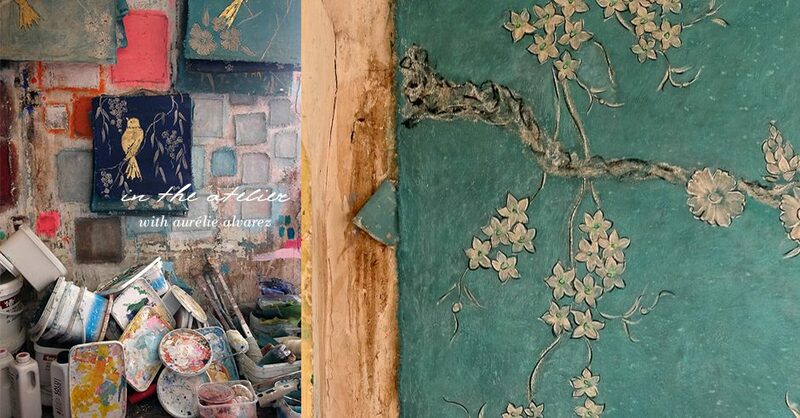 Photo credits for all these beautiful artisan and atelier images by © Ruth Ribeaucourt. Merci, Ruth! I had the pleasure of meeting this season’s featured Artisan of Provence in her welcoming oasis of an atelier space in Marseille recently. As the evenings begin to take on a distinct chill, it’s the perfect time to start thinking about texture and warmth for your interiors. Discover the delicate and intricate creations of Ghislaine Garcin featured inside our Autumn V13: Cocooning Curation (on pre-sale now). 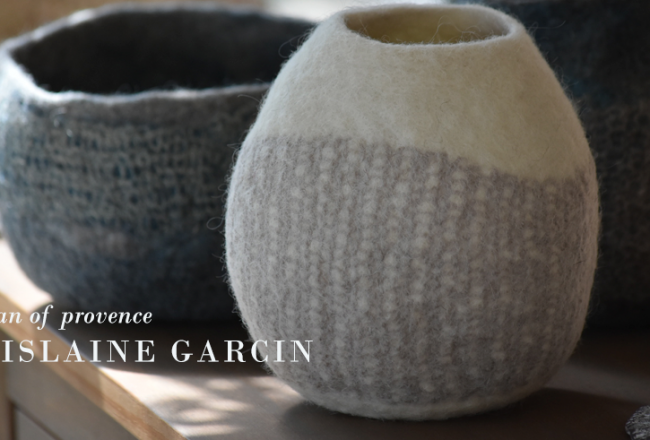 Ghislaine’s “slow textile” approach is achieved by using only natural methods and results in the creation of a stunning range of wool felt objects in a sophisticated color palette. 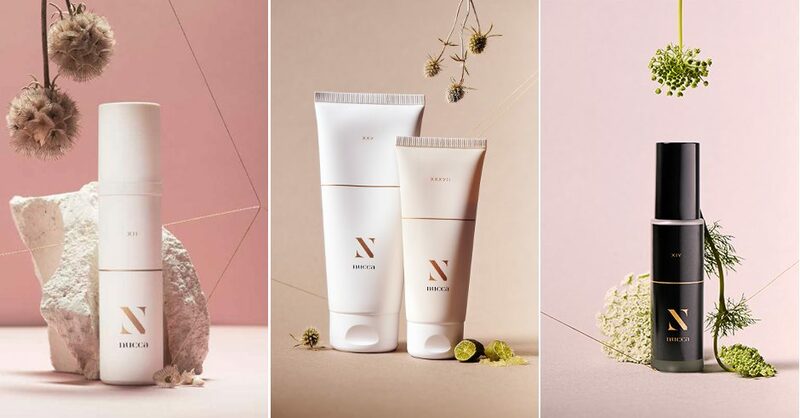 We chose a Mediterranean and neutral landscape inspired palette to be featured inside our Luxe Provence Blush curation this season. 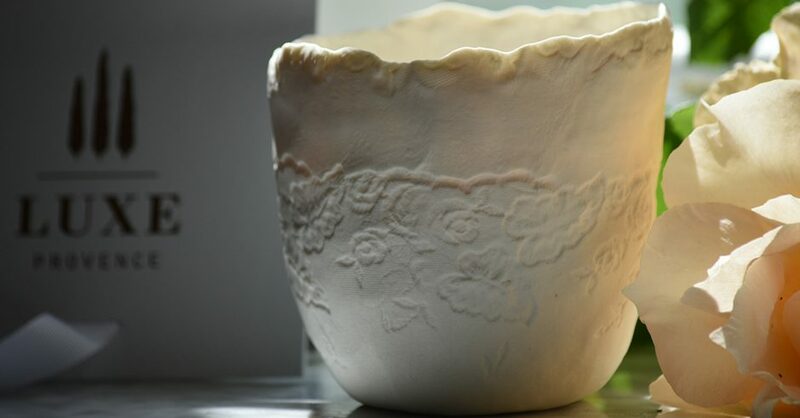 Ghislaine creates each piece by hand in her atelier in Marseille using artisanal production methods in limited editions. 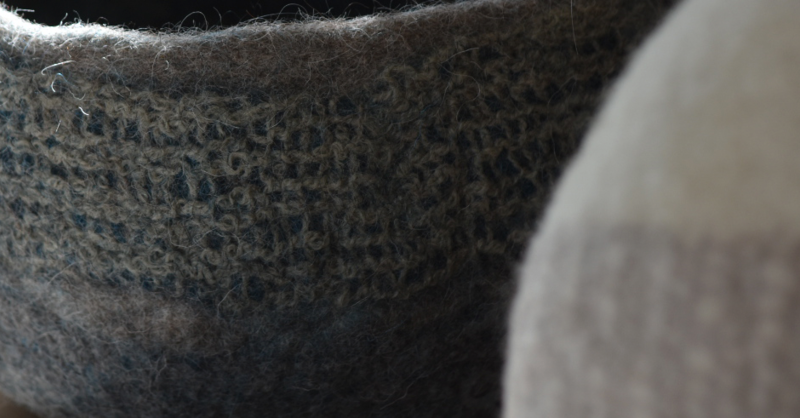 The eco-responsible materials meet the requirements of respect for the environment and of animals: yarns and fibers 100% wool (renewable, biodegradable) and are of French origin (Creuse) and European (Tyrol) origins. Ghislaine’s Maille & Feutre collection features a range of: carpets, cushions, organic shaped pots, and hanging baskets which serve functionally as the ideal ally for creating a space of intimacy and relaxation. The wool felt objects are not only beautiful but also offer many natural benefits for your indoor space, as they are: insulating, antistatic, hypoallergenic, a humidity regulator and a pollutant absorber. 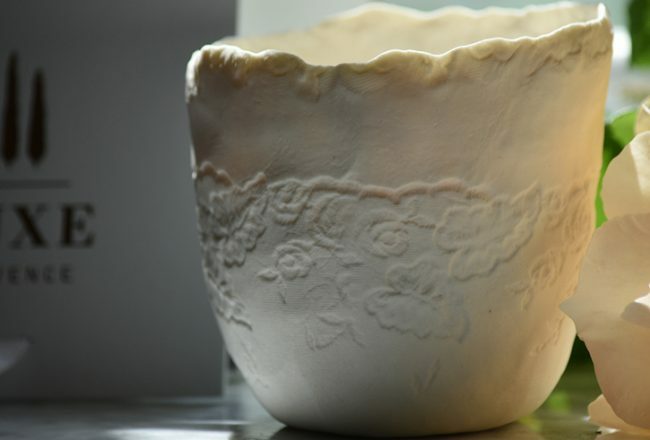 Her pieces brings a refined touch of cozy and organic natural beauty to any space. Her rugs are simply divine! 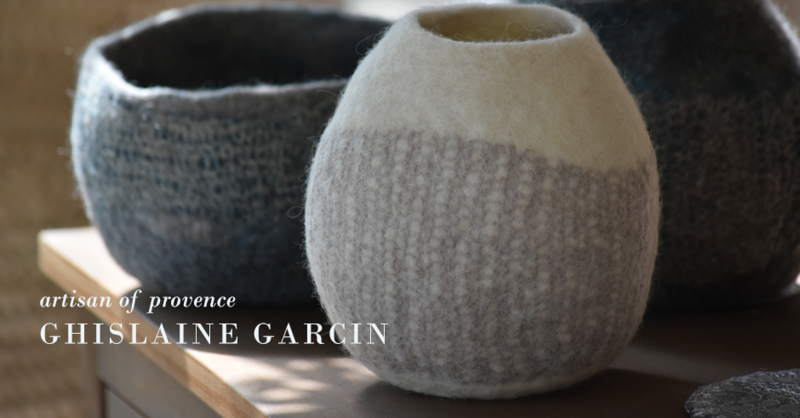 Discover Ghislaine’s beautiful, functional art (a two-piece set valued at $170) for your home inside our V13: Autumn Cocooning Curation featuring a curation of handmade objects and home fragrance Made in Provence on pre-sale now, while supplies last. Shipping begins September 28, 2018. 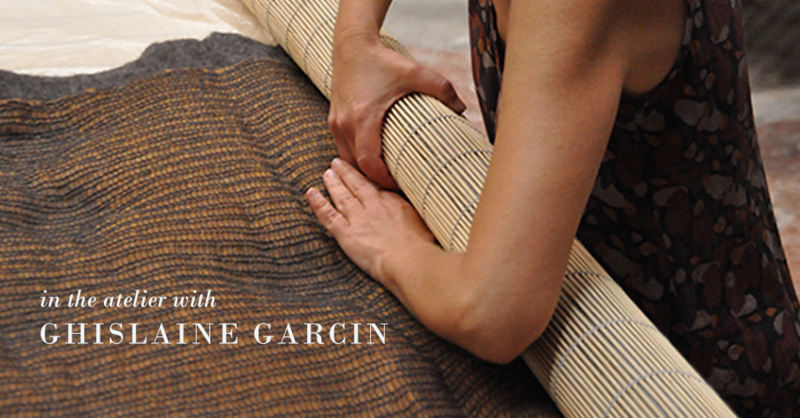 Learn more about Ghislaine Garcin (pictured above) on her website here or visit her atelier by appointment. 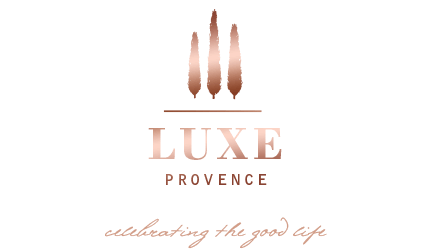 Curated and written by: Tarik Koivisto, Founder/Creative Director, Luxe Provence.